Lots of users have been downloading the new versions and checking their details or resubscribing from the Help menu. The new technology has been included in all of our products and you have the following options available from the Help menu. Choosing Check/Update Account Contact Details will take you to a web page displaying your currently recorded details. You can change these and send the changes through to us. 1. Some users may not be able to check their details. The system works by matching your registered name and some schools (such as the multitude of Sacred Heart Colleges) will not have a unique name in the registry. If this occurs, we will be automatically notified and can issue you with new codes in a unique name. There are a number of other small problems that can occur with registered names that we will work to rectify as they appear. Most users, however, can check and update. 2. Changes are NOT real time. We have decided to not put our full registry online to prevent security problems and we will vet all change requests – uploading changes about once per week. 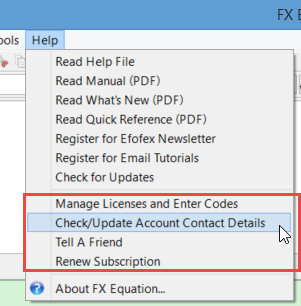 Don’t forget that you can also organize your resubscription from the same menu, or tell a friend about Efofex products – but we will discuss those in more detail in future messages.